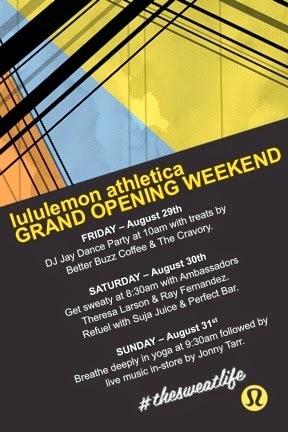 Upcoming Event: lululemon athletica Grand Opening Weekend at Fashion Valley! Check out this fun event at Fashion Valley Mall this weekend! Join lululemon athletica on Friday, August 29, as it celebrates its new location at Fashion Valley, San Diego’s premier retail destination, with a dance party by DJ Jay and treats from Better Buzz Coffee and the Cravory. The party starts at 10am. The 3,800 square-foot store is located on the second level between J. Crew and Sur La Table. On Saturday, August 30, get sweaty with lululemon Ambassadors Theresa Larson and Ray Fernandez at 8:30am in Center Court. Don’t forget to refuel with Suja Juice and the Perfect Bar. Festivities wrap up on Sunday, August 31, with yoga in Center Court, starting at 9:30am, followed by live music in-store by Jonny Tarr. lululemon athletica inc. is a yoga-inspired athletic apparel company that creates components for people to live long, healthy and fun lives. By producing products that help keep people active and stress free, lululemon believes that the world will be a better place. Setting the bar in technical fabrics and functional designs, lululemon works with yogis and athletes in local communities for continuous research and product feedback. For more information, visit www.lululemon.com.